It had been flooded and had completely ruined their old staging which was set for use in just a few weeks time for the Christmas play at the school! We were happy to help and told them about our hire services which would mean that their show could go on while they await their brand new staging order products. Once installed, we were very proud to have received a very thankful testimonial from Peter. Our customer service team strive on helping all our customers and we are very proud of this. Having been customers of your company, we did not hesitate coming to you again when disaster hit the school just before Christmas 2017. The store we held our stage in flooded and ruined the whole of the old stage we had for over 30yrs. 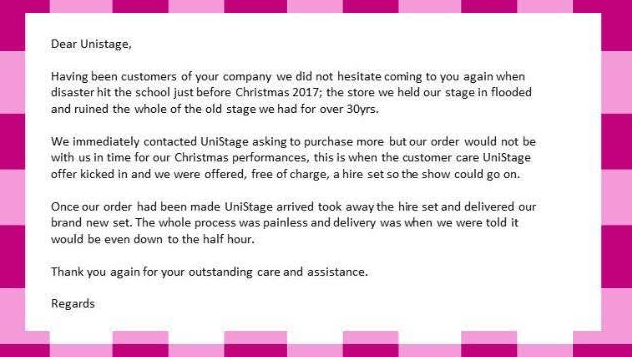 We immediately contacted UniStage asking to purchase more but our order would not be with us in time for our Christmas performances, this is when the customer care UniStage offer kicked in and we were offered, free of charge, a hire set so the show could go on. Once our order had been made, UniStage arrived, took away the hire set and delivered our brand new set. The whole process was painless and delivery was when we were told it would be even down to the half hour. Thank you again for your outstanding care and assistance. If you need any Portable Staging help, or would like to discuss a project, please do not hesitate to contact us today!